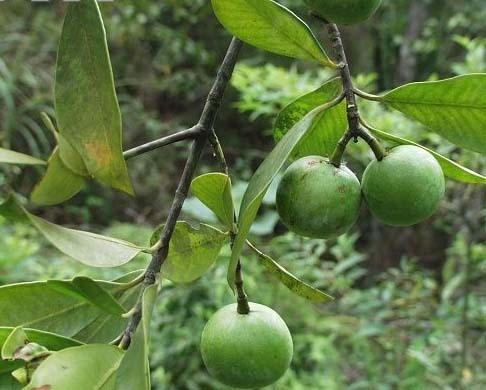 The drug is the root bark, fruit or seed of Garcinia oblongifolia Champ. (Family Guttiferae), growing in damp and fertile mountainous forest, distributed in Guangdong, Hainan and Guangxi provinces. The stem bark is used as anti-inflammatory agent and hemostatic agent, for the treatment of gastritis, peptic ulcer, eczema, stomatitis, periodontitis, ulcers of lower limb and scalds. Fruit is used to relieve sunstroke and alcoholism, to astring and promote tissue regeneration, for the treatment of abdominal distension due to retention of food, proctoptosis. Seed is used as antiinflammatory agent and analgesic, for the treatment of burns, scalds, eczema, stomatitis periodontitis, carbuncles.